The Red Lodge Clay Center is pleased to present the FREAK SHOW, an exhibition featuring figurative ceramic artwork that looks at abstraction and abnormalities within the figurative realm. Within the tradition of ceramics, the figure has been a prominent staple and continues to evolve in contemporary ceramics. This exhibition draws influence from the freak shows and traveling carnivals that once toured the country showcasing extraordinary conditions of the human physique, heavily tattooed individuals, and fire eaters. This exhibition, full of abnormalities and abstraction, will keep you entertained throughout the duration of the show! Workshop October 1, 9 - 5 p.m. Register through Quincy Art Center. The Human Figure: Proportion and the Maquette Demonstrated by Misty Gamble, observe a sculpting strategy to create a proportinoally ideal small figure study. Based on the eight head system (that Vitruvius Pollio wrote about in his influential books on architecture), understand a methodology that involves cutting a block of clay into units to create a symmetrically proportional figure in heighth, width and length. This exhibition showcases work that challenges gender conventions in distinct ways. Created in a range of ceramic media, it resonates with the broader conversation about feminism, gender, power, and beauty. Memphis College of Art is pleased to present an exhibition of over fifty ceramic artworks created by members of the Studio Nong Collective International Residency and Program. The work of this exhibition was made during the summer of 2015 in a stateside artistic even that began in Memphis, Tennessee at the Memphis College of Art and completed in Kansas City at the Kansas CIty Art Institute. 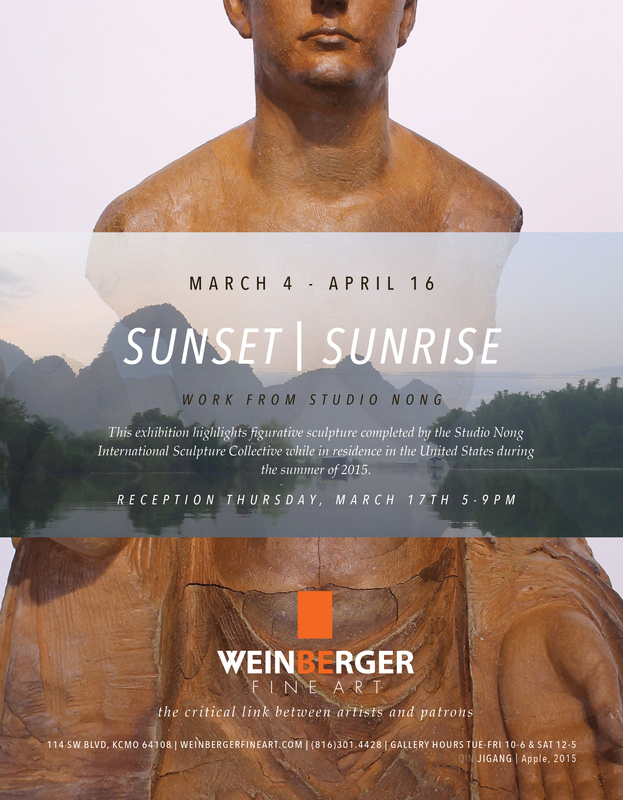 Studio Nong is an international collaboration between American and Chinese sculptors that fosters the exchange of traditions and techniques between diverse academies and cultures. Formed through a shared interest in figurative ceramic sculpture, members incorporate both past and contemporary eastern and western practices. Each member has a unique, innovative platform for approaching and creating art. This joint venture allows individuals of the collective to function simultaneously as mentor and maker for students, artists from the community, and each other. Through workshops, lectures and exhibitions, members of Studio Nong share their knowledge of innovation and cooperation with communities and institutions who recognize and appreciate art's communicative and transformative power. Participating artists are: Jessie Fisher, Misty Gamble, Scott Seebart (Kansas City Art Institute), Leandra Urrutia (Memphis College of Art), Zhenhai He, Shanwu Huang, Bangmin Nong, and Jigang Qin (Guanxi Arts Institute, China). My solo exhibit, Abject Reverie will open in St. Louis at the Duane Reed Gallery on January 25th and continues through March 9th. A new work called, "Sunday" is in this exhibit that was not featured in its Kansas City showing. Also, the works, "Covetous" and "Rapture" will be on display at the Belger Arts Center in a group show called "Adornment". This exhibition opens on First Friday, February 1st and runs through June 8th, 2013. View work by Terry Allen, Shae Bishop, Nick Bubash, William Christenberry, Viola Frey, Misty Gamble, Guy Johnson, Kate Kretz, Ed Massey, Jack Mendenhall, Ellis O'Connell, Judy Onofio, Marilyn Shapiro, Herb Snitzer, Renee Stout, William T. Wiley and others from the Belger Collection. 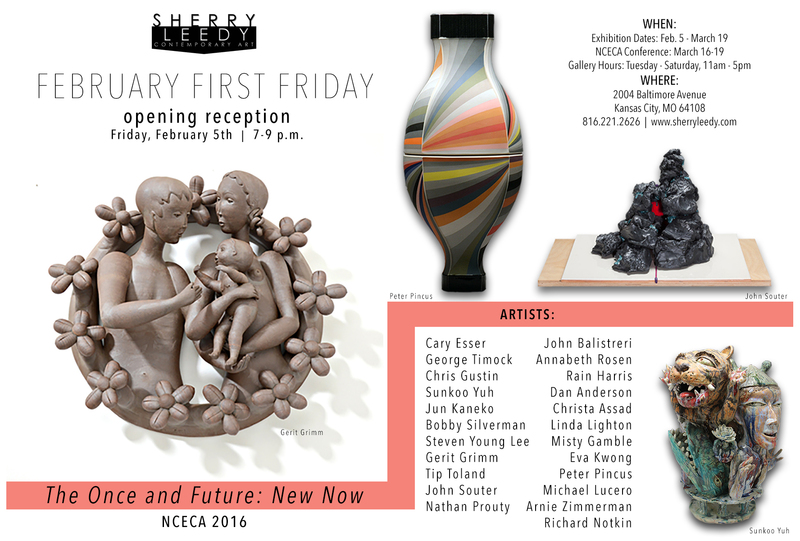 Sherry Leedy Contemporary Art will be exhibiting a solo show of my most recent work. The exhibition, “Abject Reverie: Recent works by Misty Gamble” opens November 2nd and continues through December 22nd. The opening reception is Friday, November 2nd 7-9 PM during First Fridays in the Crossroads District of Kansas City, Missouri. Also, I have had the great fortune to be published (both images and essays) in the latest Lark Books 500 series titled, “The Best of 500 Ceramics”, which celebrates the best of all the 500 Lark Books in ceramic art. I’m thrilled to be teaching full time since 2008, amongst inspiring colleagues and ambitious students, at the Kansas City Art Institute. This year I became an Assistant Professor. You can see my work in Chicago, Kansas City, and Virginia currently. Issues surrounding femininity and set standards of normalcy, propriety and societal expectation inform Misty Gamble’s work. Through this work, she confronts and challenges conventional standards of femininity, beauty, and power. Sculpted multiple figural fragments provide a perfect vehicle for communicating ideas about beauty, excess, opulence and the abject. From primping and accessorizing, her work explores these issues and how they impact womanhood. The work is influenced by her continued interest in not only figuration, but fashion, textile pattern, wallpaper and hair. On September 27th, at the University of Central Missouri, I will be lecturing on “Provocation in Ceramics”. Both the Women’s Studies program and the Art Department will be presenting this lecture. Wednesday - Thursday 9-6, Friday April 2, 9-5. Organized to coincide with the 26th Annual Alabama Clay Conference, the exhibition includes work by Christa Assad (Berkley, CA), Misty Gamble (Kansas City, MO) and Chris Gustin (South Dartmouth, MA). These three guest artists will be the featured conference presenters on stage at the Saenger Theater February 18-19, 2011. Also featured are works by three artists from our region, Scott Bennett (Birmingham, AL), Alisa Holen (Columbus, MS) and Adam Shiverdecker (Pensacola, FL). Individually, each of these six artists has what could be described as an emerging to well establish presence in the world of ceramic art. Collectively, the work included in this exhibition demonstrates a solid range of expression possible within the ceramic medium. broader concerns of the human condition. The exhibit will have pieces in a wide range of mediums and approaches to art making. I have a piece in the “NCECA Watershed Resident Showcase”, which highlights more than 30 past resident artists. The Watershed Exhibition will be in Room 408 of the Philadelphia Marriott Downtown, 1201 Market Street Thursday April 1 & Friday April 2, 9:00am - 5:00pm each day. Featured Artists: Michal Alon, Lesley Baker, Ingrid Bathe, Eve Behar, Susan Biener, Ruth Borgenicht, George Bowes, Lucy Breslin, Yasha Butler, Linda Casbon, Autumn Cipala, Israel Davis, Kate Doody, Lynn Duryea, Seo Eo, Reeder Fahnestock, Misty Gamble, Tyler Gulden, Chris Gustin, Lana Heckendorn, Sarah House, JoAnn Schnabel, Elizabeth Kendall, Brandon Lutterman , JJ McCracken, Laura Jean McLaughlin, Jeffrey Mongrain, Sean O'Connell, Shawn O'Conner, Seth Rainville, Hope Rovelto, Lauren Sandler, Amy Santoferraro, Anat Shiftan, Daniel Ricardo Teran, Sharon Townshend, Kim Tucker, Meredith Host. Work by the KCAI ceramics department will be featured in an exhibition from Oct. 24 to Nov. 21 at the Craft in America Study Center Gallery in Los Angeles. The show will include a selection of pieces made by students who were working in the department in February 2009 when Craft in America filmed a segment on KCAI that aired Oct. 7 on PBS. It also will include pieces by faculty members Cary Esser, George Timock, Paul Donnelly, Tom Binger, Misty Gamble and former department chair Victor Babu. Esser will give a presentation at the exhibition opening Oct. 24 on the KCAI ceramics program. Featuring works by Camille Claudel, Bill Abright, Margaret Keelan, Lisa Clague, Arthur Gonzalez, Shalene Valenzuela, Misty Gamble and many many others. 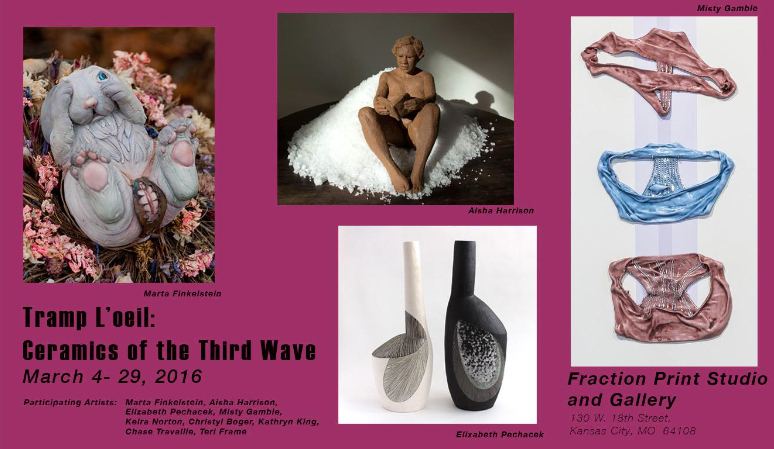 The Duane Reed Gallery is excited to present Four Fired, a group exhibition featuring the work of four female artists working in clay, whose figurative creations transcend the clay tradition by exploring the human condition. Beautifully crafted and wildly imaginative, their work address issues like identity, consumption, human desire and fear. Tip Toland's hauntingly realistic works evoke reaction as they show humanity in all states, and at all ages. The synthetic hair and wax lip used add a further life-like quality to her brutally honest figures. Beverly Mayeri's dream-like sculptures are subtlety, yet richly painted rather than glazed. She explores the contradiction and ever-changing sides of oneself, one's yearnings and fears, strengths and fragility in her work. Cynthia Consentino and Misty Gamble look more to society and cultural mores for inspiration. Gamble's eccentric personalities question the perception of normalcy and appropriateness of human and social behaviors, while Consentino layers her works with references to stories and metaphor to comment on the "dualities and apparent incongruities" within gender and societal roles. On April 24th, I’m showing a new series of work at The Armory Art Center’s annual Resident Exhibition. The exhibition will include sculptural, functional, installation, and figurative work by the 2008-2009 Resident Artists. On Wednesday, April 15th, 7:30 PM, I will be lecturing about my work in The Armory’s Library. Spring is right around the corner. Though here in Florida, it’s rather confusing having summer weather during the winter months. Soon it will be hotter than a raku kiln - where sweat pours out of your skin like it does during a bronze pour at the foundry. During the National Conference for the Education of Ceramic Arts, I’ll be showing new work created during my residency at The Armory Art Center. I have two shows during the conference and one that extends through the month of April. If you are at NCECA, you can find me at the Kansas City Art Institute table. Stop by and say hello. A few months back, when nearly everyone in this country, if not the world, was a little afraid to wake up on the morning of November 5th, Santa Fe Clay posed this question to 50 ceramic artists: What does that post-Bush world look like to you? Are you hopeful? Scared? Renewing your passport? Then the gallery asked that the artists express their speculation or dread or celebration, whatever it was they might be feeling as we rounded this corner into the unknown, in clay. Some 30 national recognized artists took up the challenge and on January 23rd, Santa Fe Clay opens a month-long exhibition titled "What the Future May Hold: Artists Consider the Post-Bush World". The roster of artists who have agreed to participate is impressive and includes many newcomers to Santa Fe Clay like Pavel Amromin, Renee Audette, Jesse Albrecht, Ehren Tool and Nuala Creed, as well as artists we have shown in the past: Joe Bova, Bart Johnson, Misty Gamble, Gena Fowler, Charles Kraft, James Tisdale, Diego Romero and many more. I will be showing new work in the Confrontational Ceramics exhibition in New York. This exhibition is a monumental encore to its 2000 predecessor. The show highlights the work of over 60 artists creating original and riveting work that prompts viewers to see clay as a medium completely unbound from its tradition, as the artists confront social, political, and environmental issues that effect us all. Cricket Engine Gallery hosts a solo exhibition of new work by Misty Gamble. Fresh off of a one-year residency at Watershed Center for Ceramic Arts in Maine, Misty exhibits ceramic sculptural figurative work from the two series “Chanel” and “Big Hair”. This solo show will engage the viewer by questioning his or her own notion of beauty and power. What is considered beautiful as one ages? How do woman empower themselves? How do power and beauty relate? I'm delighted to announce that I will be showing one of three new bodies of work created during my residency at Watershed Center for Ceramic Arts. My work continues to be informed by my interests in issues surrounding femininity and set standards of normalcy, propriety and societal expectation. In my new work, I challenge conventional notions of beauty, aging and class. The Chanel Series is comprised of three life-size ceramic women seated in chairs. These pastel colored, cosmetically enhanced women sit and pose in Chanel suits with large, elaborate coiffures. For this exhibition, I will be showing a new body of work titled, The Amour Series. The series is based on the image of the Degas ballerina and the colors of Valentine's Day. Single ballerinas are displayed in poses suggesting self-love through physical pleasure. Artists: Narcissus Quagliata, Armelle Le Roux, Misty Gamble, Joseph Distefano, Craig Clemens, Peter K. Eichhorn, Constance Levathes, Ariana Makau, Alan Rhodes, Robert Shank, Irmigard Steding, and Daniel Ziegler. The Washington State History Museum is the first museum to host Remembered Light. Glass Fragments from World War II, The McDonald Windows, a new exhibit of glass art pieces featuring shards of stained glass from European sanctuaries damaged or destroyed during World War II. U.S. Army Chaplain Frederick A. McDonald gathered more than 300 stained glass shards from the rubble of war-shattered churches and a synagogue as he traveled with General Omar Bradley’s 12th Army Group from 1944 to 1945. For the next 55 years, the glass fragments remained under McDonald’s bed in a cardboard box. One evening in 1999, during a dinner party with friends, Seattle-born McDonald shared the story of the glass shards. Stained-glass artist Armelle Le Roux met with McDonald and what ensued were a great friendship and an ambitious project to turn the glass fragments into pieces of art, each telling the story of World War II through McDonald’s eyes. McDonald worked with artists from around the world until his death in 2002, providing inspiration and focus to turn shards of stained glass into beautiful windows through which light would once again shine. With Le Roux as the project leader, the artists incorporated the shards and McDonald’s recollections into windows and other works, each offering a snapshot of McDonald’s experiences in war-torn Europe. In all, 13 artists created 25 windows and other glass art pieces in diverse media including ceramic, silkscreen, vinyl, copper, and glass. Their work takes a range of forms and dimensions, varying from a 9 x 14-inch glass book by Le Roux, its shard from an unknown site, to a 41 x 30-inch crown of thorns created in antique glass by Narcissus Quagliata, with shards from the Cathedral of St. Stephen in Metz, France. Remembered Light: Glass Fragments from World War II, The McDonald Windows was developed by the Frederick A. McDonald Foundation. After a national tour, the exhibit will be permanently housed at the Presidio Main Post Interfaith Chapel in San Francisco. This national invitational exhibition will include work that illuminates the vices of Lust, Gluttony, Greed, Sloth, Wrath, Envy and Pride. Artists: Misty Gamble, Chuck Aydlett, Tom Bartel, Russell Biles, Joe Bova, Cynthia Consentino, Linda Cordell, Myra Dalland, Kowkie Durst, Debra Fritts, Lauren Gallaspy, Carol Gentithes, Arthur Gonzalez, Elizabeth Hunt, Jared Janovec, Tsehai Johnson, Bart Johnson, Margaret Keelan, Kathy King, Max Lehman, Emily McGarrity, Ron Meyers, Andy Nasisse, Kelly Rathbone, Lisa Reinertson, Katy Rush, Matt Shaffer, Kevin Snipes, James Tisdale, Kurt Weiser, Christina West. This invitational annual show features artists that have risen to the top of their classes in Bay Area graduate arts programs. The 16 artists come from California College of the Arts, Mills College, San Francisco Art Institute, San Francisco State University, Stanford University, and University of California, Berkeley. 2007 Cream Artists: Misty Gamble, Lindsay Benedict, Robert Burden, Julie Chang, Erika Dawn, Sophie de Lignerolles, Lori del Mar, Kara Hearn, Ginelle Hustrulid, Bessma Khalaf, Dan Lydersen, Emily McLeod, Karen Olsen-Dunn, Kamau Amu Patton, Heather Sparks, Edmund Wyss, Jenny Zito Artists' Forum Saturday, August 25th.